In a new video for 2017 , an upcoming survival-horror mod for Arma 3 , the creature prototypes hint at multiplayer enemies with a dark and—and maybe inhuman—past. A good horror story usually has a moment where the hunted get's a glimpse of what's hunting him. It's often a split second of terror where the main character finally realizes just how out-matched he really is. And with its creeper and sadist characters, 2017 is putting its idea of horror on clear display. The two creatures support the mod's move away from a scenario of infected humans initially proposed as a setting for the mod last year. 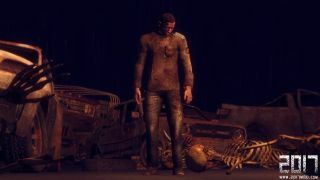 Taking place some years after the collapse of human civilization, 2017 will put players in a survival role inspired by post-apocalyptic fiction such as The Road . With this inspiration in mind, beasties like the sadist, with his bulging belly and burlap-sack mask point to the corruption of a person who at one time, maybe, was just like everyone else. The creepers on the other hand, with their burned-looking flesh and spindly bodies, set an entirely different mood. If the sadist has kept his more-or-less human appearance in the wake of the apocalypse, the creepers are something else entirely. The video above has packs of the prototype creatures lurking around the broken-down Arma 3 landscape with animation that only makes them seem more faceless and evil. The video also gives some insight into the mod's progress, with the announcement that a closed alpha build is being tested this month. For more on 2017, be sure to check out its official website and forum here .